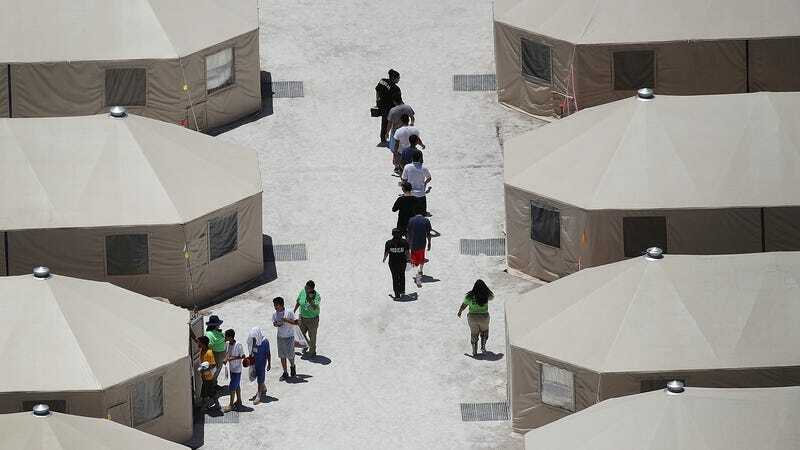 The Tornillo detention facility—a cluster of beige tents on a patch of desert in West Texas, encircled by layers of wire fencing that separates it from the dirt roads and cotton fields that make up this corner of the state—was supposed to be temporary. Built earlier this summer to house unaccompanied children and teenagers who came to the border largely to seek asylum, it has been condemned as inhumane: In the summer, temperatures there can reach up to 110 degrees. But increasingly, it seems to be a permanent fixture of our immigrant detention system—and in recent weeks, the Department of Health and Human Services has sent even more migrant children to Tornillo, waking up hundreds of children who had been held at Health and Human Services-funded shelters scattered around the country in the middle of the night and busing them to West Texas, with little advance notice and with nothing more than their clothes and a backpack. According to the Times, more than 1,600 children have been sent to Tornillo in recent weeks. While federal officials claim that the moves are meant to address the growing number of migrant children and teens held in the shelter system—which have been at 90 percent capacity since earlier this summer—what they often fail to acknowledge is that this is largely a problem of their own making. The increase in the number of children and teenagers in federal custody is not the result of a huge upsurge in the number of unaccompanied minors coming to the U.S.—it is, rather, the completely predictable result of Trump administration policies that have made these children’s family members reluctant to come forward as sponsors. Earlier this summer, HHS and Immigration and Customs Enforcement began requiring background checks and the fingerprints of potential sponsors, leading immigrant rights advocates to raise fears that sponsoring family members—many of whom are undocumented—would be targeted. Last week, ICE official Matthew Albence confirmed that this is indeed happening. After the background check and fingerprinting requirements were put in place, ICE arrested 41 people between June and September who volunteered to sponsor children held in federal custody—70 percent of those arrested had no prior criminal record.